It's odd that Can never released a live album in their 1970s heyday - this was a band famous for both rearranging existing material and 'spontaneous composition' on stage, and their performances have achieved a kind of semi legendary status over the years. 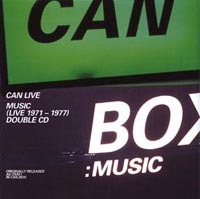 This double CD was assembled from unofficial recordings for the release of a package that also contained an autobiographical book and a video - the Can Box - and features performances from 1972-1977. Three different line ups are represented here, with the post Damo Suzuki quartet dominating the proceedings and the early version with Malcolm Mooney not featuring at all. Most of the recordings are from UK concerts, with a couple from Germany, and there is a good mix of improvisation and well known album tracks. There is also some blurring of the boundaries; the composed material is reinterpreted, sometimes quite radically, while the improvisations sometimes contain recognisable fragments of album tracks and the 37 minute Colchester Finale (the only track to feature Damo Suzuki) gradually morphs into a thunderous reading of Halleluwah. This is really one for the fans .The sound quality is rarely better than adequate, but the performances are often incendiary, and all the elements that Can fans know and love are present and correct - Liebezeit's metronomic drumming, Czukay's minmalist bass lines, Karoli's gypsy-blues-raga guitar and Schmidt's washes of keyboard textures, with Damo Suzuki and Rosko Gee adding their own seasoning to the stew where they're featured. Vital for Krautrock afficianados, but newcomers would do better to start with one of the early studio albums.